27 Dec 16: The latest version (3.4.0) of the free FISTS Log Converter program for Windows is now available. This version supports 2017 Activities: Ladder (FISTS Europe), Cumulatives (FISTS Americas), Snakes & Ladders (EuCW), & QRS Week (EuCW). FISTS Log Converter can be used in conjunction with almost all amateur radio logbook programs -or- for anyone not currently using one, it includes its own optional, easy-to-use logbook. The program is available from the download web page. Many thanks to the testers: Dennis K6DF, Peter G4LHI, and Richard G0ILN. 24 Dec 16: Please join us in the FISTS CW Club Europe Ladder sessions: Sunday 25 December 1400-1600 & 1800-2000 UTC. Name, QTH, RST, & member number (if applicable). QSOs are friendly and conversational. Submitting logs is very much appreciated but not essential. Members from all FISTS Chapters are encouraged to join in; QSOs do not have to be with FISTS members. Have a very happy Christmas and good wishes for the New Year from all at FISTS CW Club. 24 Dec 16: PRIZES!! Win a bug key! The final 2016 session of the FISTS Americas Cumulatives takes place Sunday 25 December 2000-2200 UTC (*note the change of times for November & December). This is a relaxed activity with minimum 5 minute QSOs. Even if you don't want to send an entry in - and we hope you will - you can come along for some friendly QSOs and perhaps get some points towards FISTS Awards. RST, name, QTH or state, and member number (if applicable). Calling "CQ FISTS" is recommended. Don't forget to log QSO end times! Vibroplex "Bug" Keys will be awarded to 1st, 2nd, & 3rd place operators! Be sure to send in your logs! NOTE: FISTS CW Club Officers are NOT eligible for key prizes. See the full details on the website. The free FISTS Log Converter program for Windows can be used to create and submit logs at the end of each month. Select the "Activities" tab, then the month, and then "Cumulatives". 18 Dec 16: If you haven't already, please submit your log for Straight Key Week 2016 (FISTS CW Club Europe) no later than 31st December. The results will be published around mid-January. For more information about FISTS Awards, available free to paid-up members worldwide, please see the Awards web page. 11 Dec 16: The FISTS BrassPounder December 2016 newsletter has just been published. BrassPounder provides the results and comments for FISTS CW Club on-air Activities in Europe/UK. This edition includes details of the November 2016 FISTS Ladder and Two Metre activities. 11 Dec 16: The FISTS CW Club Americas Cumulatives Report December 2016 is now available. It contains the monthly results and soapbox comments for the FISTS Americas Cumulatives on-air activity in November 2016. 10 Dec 16: Please join us in the FISTS CW Club Europe Ladder sessions: Sunday 11 December 1400-1600 & 1800-2000 UTC. 10 Dec 16: PRIZES!! Win a bug key! The penultimate 2016 session of the FISTS Americas Cumulatives takes place Sunday 11 December 2000-2200 UTC (*note the change of times for November & December). Ladder (FISTS CW Club Eu) no later than 10 December. Two Metre Activity (FISTS CW Club Eu) no later than 10 December. Snakes & Ladders (EuCW) no later than 7 December. Even if you only had one QSO or feel that you can't win, it's really helpful to send in logs to encourage others to join in. See the Activity Calendar web page for details on sending in FISTS Eu activity logs. See the EuCW Snakes & Ladders web page for details of sending in logs for it. 04 Dec 16: Please submit your November logs for the FISTS CW Club Americas Cumulatives by the end of December 10th (ignore any warnings about late entries from FISTS Log Converter). Even if you only had one QSO, it's very helpful to send in logs to encourage others to join in and give you a chance of winning one of the Vibroplex bug key prizes. 03 Dec 16: Straight Key Week is here! Please join us in the one of the most popular FISTS CW Club Europe Activities, running from 00:01 on Sunday 04 December to 23:59 on Saturday 10 December 2016 UTC. Name, RST, QTH, & member number (if applicable). Note: you can contact the same operator once per day. QSOs are friendly and conversational. Submitting logs is not essential but very much appreciated. Members from all FISTS Chapters are encouraged to join in; QSOs do not have to be with members of FISTS Europe. 30 Nov 16: The new FISTS CW Club Americas KeyNote newsletter Issue 4, 2016 is ready to download for all current FISTS members. An Early Example of the Dreaded Rettysnitch? Current members of FISTS Down Under, FISTS East Asia & FISTS Europe can use their FISTS Europe website password to get a copy. 27 Nov 16: The FISTS BrassPounder November 2016 newsletter has just been published. This edition includes details of the October 2016 FISTS Ladder and QRS Fifth Sunday 2016 activities. 27 Nov 16: The FISTS CW Club Americas Cumulatives Report November 2016 is now available. It contains the monthly results and soapbox comments for the FISTS Americas Cumulatives on-air activity in October 2016. 26 Nov 16: PRIZES!! Win a bug key! The next session of the FISTS Americas Cumulatives takes place Sunday 27 November 2000-2200 UTC (*note the change of times for November & December). 26 Nov 16: FISTS CW Club Europe Weekend activities 27 November 2016. Ladder sessions: Sunday 27 November 1400-1600 & 1800-2000 UTC. RST, name, 6-character locator, & member number (if available). 13 Nov 16: PRIZES!! Win a bug key! The next session of the FISTS Americas Cumulatives takes place Sunday 13 November 2000-2200 UTC (*note the change of times for November & December). 13 Nov 16: FISTS CW Club Europe Weekend activities 13 November 2016. Ladder sessions: Sunday 13 November 1400-1600 & 1800-2000 UTC. 04 Nov 16: The FISTS CW Club Europe 2m CW Activity is back for the month of November. Activity is on Saturdays and Sundays 0900-1000 UTC around 144.052 MHz (keep at least 1 kHz away from 144.050 MHz). One QSO with an operator per day. Note: The session on Sunday 6 November is during the RSGB Marconi CW 2m Contest; add a serial number to the exchange and enter both! 04 Nov 16: The RSGB Marconi CW 2m Contest is this coming Weekend, 5 November 1400 UTC - 6 November 1400 UTC. It is part of a Europe-wide contest and is the third out of three annual RSGB VHF CW contests (4m, 6m and 2m). Unlike HF contests, QSOs are a bit more relaxed and don't expect to get 599 for each QSO! The exchange is RST, serial number and 6 character locator. Most activity centres around 144.050, with the primary CW band plan area 144.025 - 144.110MHz MHz. 30 Oct 16: Please submit your October logs for the FISTS CW Club Americas Cumulatives by the end of November 5th. Even if you only had one QSO, it's very helpful to send in logs to encourage others to join in and give you a chance of winning one of the Vibroplex bug key prizes. Ladder (FISTS CW Club Eu) no later than 5 November. QRS Fifth Sunday (FISTS CW Club Eu) no later than 10 November. Snakes & Ladders (EuCW) no later than 7 November. 30 Oct 16: The FISTS CW Club Americas Cumulatives Report October 2016 is now available. It contains the monthly results and soapbox comments for the FISTS Americas Cumulatives on-air activity in September 2016. 30 Oct 16: The FISTS BrassPounder October 2016 newsletter has just been published. This edition includes details of the September 2016 FISTS Ladder and Two Metre 2016 activities. 28 Oct 16: The fourth and final FISTS CW Club Europe QRS Fifth Sunday is 30 October, 0001-2359 UTC - a whole day of QRS activity, maximum 14 wpm. *** Don't forget to write QRS in your logbook's 'Comment' (or similar) field if you are sending in a log. 21 Oct 16: FISTS CW Club Europe Weekend activities 23 October 2016. Please join us in the Ladder sessions: Sunday 23 October 1400-1600 & 1800-2000 UTC. 21 Oct 16: The next session of the new FISTS Americas Cumulatives takes place Sunday 23 October 1900-2100 UTC. 08 Oct 16: FISTS CW Club Europe Weekend activities 09 October 2016. Please join us in the Ladder sessions: Sunday 09 October 1400-1600 & 1800-2000 UTC. 08 Oct 16: The next session of the new FISTS Americas Cumulatives takes place Sunday 09 October 1900-2100 UTC. 08 Oct 16: The FISTS CW Club Americas Fall Unlimited Speed Sprint takes place on Saturday 08 October 1700-2100 UTC on 80m, 40m, 20m, 15m & 10m. RST, U.S. state or Canadian province or DXCC country, first name, FISTS member number. Non-members send their power output in Watts instead of a member number. Members worldwide are invited to participate. For N1MM contest logger users, a User Defined Contest (UDC) file is available. Go to the N1MM website, choose "FILES" then "User Defined Contests (UDC)" and look for the file G3ZQSmem.zip (can be used for Sprints despite the name). A FISTS Call History File is also available. Ladder (FISTS CW Club Eu) no later than 10 October. Accuracy Challenge (FISTS CW Club Eu) no later than 10 October. Snakes & Ladders (EuCW) no later than 7 October. 04 Oct 16: Please submit your September logs for the FISTS CW Club Americas Cumulatives by the end of October 10th. Even if you only had one QSO, it's very helpful to send in logs to encourage others to join in. Note: if using FISTS Log Converter to send in your log (recommended), please ignore the message saying that logs should already have been submitted (this is fixed in version 3.3.4). 30 Sep 16: The FISTS CW Club Americas Fall Slow Speed Sprint (max. 13 wpm) takes place on Saturday 01 October 1700-2100 UTC on 80m, 40m, 20m, 15m & 10m. 23 Sep 16: FISTS CW Club will be at the National Hamfest at Newark, UK, on Saturday 1st October 2016 - please come and visit us! The National Hamfest opens at 09:30 BST. For more information, see http://www.nationalhamfest.org.uk. 23 Sep 16: The next session of the new FISTS Americas Cumulatives takes place Sunday 25 September 1900-2100 UTC. Listen out for the FISTS Club callsign KN0WCW during this session! 23 Sep 16: FISTS CW Club Europe Weekend activities 25 September 2016. RST, name, QTH, member number*, 3-letter word*, 3-digit number*. Ladder sessions: Sunday 25 September 1400-1600 & 1800-2000 UTC. 21 Sep 16: The new FISTS CW Club Americas KeyNote newsletter Issue 3, 2016 is ready to download for all current FISTS members. How I Became an Old-Time Landline Telegrapher (for a day). When All Else Fails Use a Straight Key! The Fun of Morse Code. 16 Sep 16: The FISTS CW Club Americas Cumulatives Report September 2016 is now available. It contains the monthly results and soapbox comments for the FISTS Americas Cumulatives on-air activity. 16 Sep 16: The FISTS BrassPounder September 2016 newsletter has just been published. This edition includes details of the August 2016 FISTS Ladder and Two Metre 2016 activities. 10 Sep 16: FISTS CW Club Europe Weekend activities 11 September 2016. Ladder sessions: Sunday 11 September 1400-1600 & 1800-2000 UTC. 10 Sep 16: The next session of the new FISTS Americas Cumulatives takes place Sunday 11 September 1900-2100 UTC. Listen out for the FISTS Club callsign KN0WCW during this session! 01 Sep 16: FISTS CW Club will be at the Telford HamFest (UK) on Sunday 4th September 2016, so please come and say hello. The doors open at 10:15 BST and maps etc. are available from the Telford HamFest website. 01 Sep 16: FISTS CW Club Americas G3ZQS Memorial Straight Key Contest starts on Friday 2nd September 23:00 UTC and runs until Sunday 4th September 23:00 UTC. RST, U.S. state/Canadian province/DXCC country, first name, FISTS number (or power output for non-FISTS). For N1MM contest logger users, a User Defined Contest (UDC) file is available. Go to the N1MM website, choose "FILES" then "User Defined Contests (UDC)" and look for the file G3ZQSmem.zip (can be used for Sprints despite the name). A FISTS Call History File is also available. Thanks to Les G4OGB for providing the UDC file. Ladder (FISTS CW Club Eu) no later than 5 September. Two Meter (FISTS CW Club Eu) no later than 10 September. Snakes & Ladders (EuCW) no later than 7 September. 30 Aug 16: Please submit your August logs for the FISTS CW Club Americas Cumulatives by the end of September 5th UTC. Even if you only had one QSO, it's very helpful to send in logs to encourage others to join in. Note: if using FISTS Log Converter to send in your log (recommended), please ignore the message saying that logs should already have been submitted (this will be fixed in the next version). 27 Aug 16: The second session of the new FISTS Americas Cumulatives takes place Sunday 28 August 1900-2100 UTC. 27 Aug 16: FISTS CW Club Europe Weekend activities 28 August 2016. Ladder sessions: Sunday 28 August 1400-1600 & 1800-2000 UTC. 24 Aug 16: The FISTS BrassPounder August 2016 newsletter has just been published. This edition includes details of the FISTS July 2016 Ladder and QRS Fifth Sundays 2016 activities. 14 Aug 16: The first session of the new FISTS Americas Cumulatives takes place today, Sunday 14 August 1900-2100 UTC. 11 Aug 16: FISTS CW Club Europe Weekend activities 13/14 August 2016. Ladder sessions: Sunday 14 August 1400-1600 & 1800-2000 UTC. 05 Aug 16: The FISTS CW Club Europe 2m CW Activity is back for the months of August & November. During August, activity is on Saturdays and Sundays 0800-0900 UTC around 144.052 MHz (keep at least 1 kHz away from 144.050 MHz). Ladder (FISTS CW Club Eu) no later than 10 August. QRS Fifth Sunday (FISTS CW Club Eu) no later than 10 August. Snakes & Ladders (EuCW) no later than 7 August. 29 Jul 16: The next FISTS CW Club Europe QRS Fifth Sunday is 31 July, 0001-2359 UTC - a whole day of QRS activity, maximum 14 wpm. 23 Jul 16: Please join us in FISTS CW Club Europe Ladder sessions: Sunday 24 July 1400-1600 & 1800-2000 UTC. QSOs are friendly and conversational. Submitting logs is very much appreciated but not essential. Members from all FISTS Chapters are encouraged to join in; QSOs do not have to be with members of FISTS Europe. 08 Jul 16: The FISTS BrassPounder July 2016 newsletter has just been published. 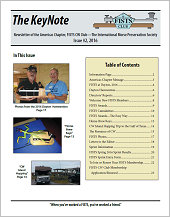 This edition includes details of the FISTS June 2016 Ladder and Mechanical Key Days 2016 activities. It also covers the new FISTS DXCC League web page and new FISTS Americas Cumulatives activity. 08 Jul 16: Please join us in FISTS CW Club Europe Ladder sessions: Sunday 10 July 1400-1600 & 1800-2000 UTC. 06 Jul 16: The FISTS CW Club Americas Summer Unlimited Sprint takes place on Saturday 09 July 0000-0400 UTC (note: this is Friday evening in the US) on 80m, 40m, 20m, 15m & 10m. 02 Jul 16: There is a new FISTS CW Club Americas Yahoo Group - FISTS members and non-members are invited to join. Please mention your callsign when signing up. Yahoo Groups provide access by email alone or by the web interface, and in addition to messaging, features include polls and libraries of links, photos, and files. 01 Jul 16: The new FISTS CW Club Americas KeyNote newsletter Issue 2, 2016 is ready to download for all current FISTS members. CW Island Hopping Trip to the Gulf of Texas. FISTS Spring 2016 Sprint Results. Ladder (FISTS CW Club Eu) no later than 10 July. Snakes & Ladders (EuCW) no later than 7 July. 01 Jul 16: The FISTS CW Club Americas Summer Slow Speed Sprint (max. 13 wpm) takes place on Saturday 02 July 0000-0400 UTC on 80m, 40m, 20m, 15m & 10m. 30 Jun 16: The "summer/autumn" EuCW Snakes & Ladders run starts on Friday July 1st and ends on December 31st. If you've not participated previously, now is a great time to start. QSOs must take at least five minutes, stations must be European stations and the mode must be CW. Each station may be contacted once per day, irrespective of the band. For more details, please see the comprehensive rules. 26 Jun 16: Please join us in FISTS CW Club Europe Ladder sessions: Sunday 26 June 1400-1600 & 1800-2000 UTC. 16 Jun 16: The latest version (3.2.10) of the free FISTS Log Converter program for Windows is now available. This version incorporates the new EuCW Snakes & Ladders rules for frequencies in the 30m and 80m bands for June 2016 onwards. The program is available from the download web page. Many thanks to the test team: Alex PA1FOX, Peter G4LHI, and Richard G0ILN. 11 Jun 16: The FISTS BrassPounder June 2016 newsletter has just been published. 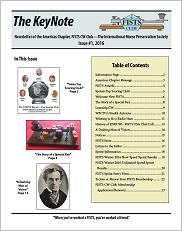 This edition includes details of the FISTS May 2016 Ladder and Fifth Sunday activities. 11 Jun 16: Please join us in FISTS CW Club Europe Ladder sessions: Sunday 12 June 1400-1600 & 1800-2000 UTC. 11 Jun 16: If you haven't already, please submit your log for the FISTS CW Club Eu Mechanical Key Days 2016 activity no later than 30 June. Results will be published in the July 2016 edition of Brasspounder. 05 Jun 16: FISTS CW Club Europe's new Mechanical Key Days 2016 on-air activity starts at 00:01 Monday 6th June and runs until 23:59 Friday 10th June UTC. Please dust off your bug key, sideswiper or straight key and join us. QSOs don't have to be with stations also using mechanical keys, but if (hopefully) you are going to send in a log, you must use a mechanical key. *** Don't forget to write MKD for each qualifying QSO in your logbook's 'Comment' (or similar) field. 27 May 16: The next FISTS CW Club Europe QRS Fifth Sunday is 29 May, 0001-2359 UTC - a whole day of QRS activity, maximum 14 wpm. 20 May 16: Please join us in FISTS CW Club Europe Ladder sessions: Sunday 22 May 1400-1600 & 1800-2000 UTC. 14 May 16: The RSGB 4m (70 MHz) CW Contest 2016 is Sunday 15 May 0900-1200 UTC. The exchange is: RST, Serial Number (starting at 001) and a 6 character (e.g. IO92JL) locator and UK stations send the first 2 letters of their Postcode. This is one of three RSGB VHF CW contests (6m, 4m, & 2m). These are more relaxed than HF contests and typically 'real' RSTs are exchanged, so have fun and listen carefully! 13 May 16: The FISTS CW Club Americas Spring Unlimited Sprint takes place on Saturday 14 May 1700-2100 UTC on 80m, 40m, 20m, 15m & 10m. 08 May 16: The FISTS BrassPounder May 2016 newsletter has just been published. This edition includes details of the FISTS April 2016 Ladder. 08 May 16: Please join us in FISTS CW Club Europe Ladder sessions: Sunday 08 May 1400-1600 & 1800-2000 UTC. 06 May 16: The FISTS CW Club Americas Spring Slow Speed Sprint (max. 13 wpm) takes place on Saturday 07 May 1700-2100 UTC on 80m, 40m, 20m, 15m & 10m. See the EuCW/AGCW QRS Week and EuCW Snakes & Ladders web pages for details of sending in logs for them. 29 Apr 16: The new FISTS CW Club Americas April 2016 KeyNote newsletter is ready to download for all current FISTS members. The Story of a Special Key. Wanting to Be a Radio Ham. History of KN0WCW-FISTS USA Club Call. A Dashing Man of Vision. 22 Apr 16: The EuCW/AGCW QRS Activity Week 2016 takes place this coming week Monday 25 April 00:00 - Friday 29 April 23:59 UTC. The maximum speed is 14 wpm and any band can be used. QSOs must be at least 5 minutes long. For more information and a list of recommended frequencies, please see the EuCW web page. FISTS CW Club is a member of EuCW, so please support this activity. The free FISTS Log Converter program for Windows makes it easy to create and send in logs for the QRS Activity Week. 22 Apr 16: Please join us in FISTS CW Club Europe Ladder sessions: Sunday 24 April 1400-1600 & 1800-2000 UTC. 17 Apr 16: The St. Richard's Catholic College ARISS contact in Bexhill will take place on Monday, April 18, 2016 at 14:56:06 GMT (3:56:06 pm BST) with Tim Peake GB1SS. HERC (Hastings Electronics and Radio Club) has been invited to witness the contact and participate in the interactive STEM space conference. HERC operators will be on air with G6HH from St. Richard's grounds using a full G5RV. FISTS members will be present on the station which has been kindly organised by FIST Phil G3MGQ. A mixture of voice and CW is expected on the day. FISTS members are invited to contact G6HH at St. Richard's Catholic College in Bexhill and share a fantastic day together. Please note that G6HH will be QRT around the time of the contact, and return to air when the ARISS UK team give the go ahead to ensure that ISS contact operations run smoothly. 16 Apr 16: The March 2016 Key Note is now available to all current FISTS CW Club members. How I learned Morse ... and whatwas good for me! Book review: The Long Silence Falls, Volume 2. Arthur J. Gould, G3JKY, SK. George M. Allan GM4HYF, SK. 07 Apr 16: Please join us in FISTS CW Club Europe Ladder sessions: Sunday 10 April 1400-1600 & 1800-2000 UTC. 07 Apr 16: The FISTS BrassPounder April 2016 newsletter has just been published. This edition includes details of the FISTS March 2016 Ladder and Exchange Your Age Week 2016. 06 Apr 16: The April 2016 FISTS CW Club Down Under newsletter is available. FISTS Down Under is the Australian & New Zealand Chapter of the FISTS CW Club. 05 Apr 16: FISTS will be attending the NARSA Rally at the Norbreck Exhibition Centre, Blackpool, UK on Sunday 10th April. We're on stand 10, which is in the main hall in the corner to the left of the snack bar. This is a lively event with a wide range of club and trade stands - well worth a visit. The entrance fee is £5. The doors open at 10:30 BST and maps etc. are available on the NARSA website. NARSA is providing RSGB Morse Competency tests at the rally. 28 Mar 16: The new Single Lever Portable Torsion Bar Key with 'Station' Base portable paddle from KX3 Helper looks great and functions like no other. It's an all new key that you'll be proud to own and use on your next portable outing or at home in the shack. Built to function equally as well as a sideswiper (cootie) key, it gives you options that only a single lever key can offer. The base is milled out of a solid block of aluminum and there is an optional stainless steel base for home use. The control lever "carrier" is brass and the finger pieces are made of rare woods with a signature Mother-Of-Pearl dot on each side. 24 Mar 16: Did you know that the quarterly newsletter "Hot Iron" from Tim Walford G3PCJ of Walford Electronics has been available free via email since September 2015? If you would like to be added to the distribution list, please send Tim an email addressed to . 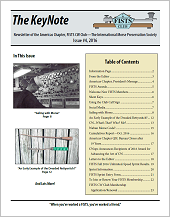 "Hot Iron" contains articles on circuits for amateur radio receivers, transmitters, test gear, antennae, construction methods, new kit developments, and feedback on builders' experiences. 23 Mar 16: The new Mini Keying Adapter from Hamgadgets (USA) allows keyers such as the Ultra PicoKeyer to key transmitters such as those based on the Pixie design that require switching of a relatively high current of around several hundred milliamps. The Mini Keying Adapter is available either as a kit or assembled. 20 Mar 16: The new Isle CW Transmitter Kit from Walford Electronics (Tim G3PCJ) is available in single-band and 3-band versions. It provides 1.5 Watts from a 12 Volt supply. The single band Isle includes a 3.58 MHz ceramic resonator for 80m which can be pulled over several tens of KHz down from the nominal figure using the on board trimmer. It can use a crystal or ceramic resonator for frequency control. The band can be any one of those in the 20 - 80m group. For the three band Isle (as opposed to three frequencies all in the same band), you need to add the Twin LPF kit as well as the extra crystals. The control of the crystals and the filter relays are both done by the same contacts of the rig's centre off band switch. The TX RF output path to the extra filters is switched by the extra relays of the Twin LP kit that are connected either side of the original filter on the TX PCB. This also allows the same set of filters and aerial changeover relay to be used when the Linear is also installed. 19 Mar 16: SOTAbeams (Richard G3CWI) is offering pre-order of a new range of ready-made LASERBEAM digital audio filter modules. These are the perfect addition to your project or even to your existing radio. Unlike analogue filters, digital filters provide near-perfect characteristics. Because of the way that they are implemented, they are better than analogue filters in almost every way! The General Purpose module has a narrow CW filter (550 - 850 Hz) and an SSB filter (300 - 2700 Hz). The CW module has two narrow filters (550 - 850 Hz) and (300 - 1300 Hz). The SSB module has a standard SSB filter (300 - 2700 Hz) and a narrow SSB filter (300 - 2400 Hz). There is also a hardware integration kit available, which is currently on offer at half price. 16 Mar 16: HamGadgets (USA) is now stocking the 20m, 30m, 40m, and 80m versions of the QRPme Rockmite ][ crystal-controlled QRPP CW transceiver kits and enclosures. For more information, see the HamGadgets Rockmite page. 15 Mar 16: Dan M0TGN is working with Dennis G6YBC (Kanga Products) to provide his Arduino-based Morse tutor as a kit. If you would like to register an interest in this and receive updates on the project, you can fill in the Morse Tutor - Enquiry form. For more details on the Morse tutor, please see Dan's November 2015 Blog entry. 14 Mar 16: The Palm Radio PaddleBase is a heavy base stand for Palm Radio Mini and Micro paddles and is available now in limited quantity. This solid base is about 15 mm high and the diameter is about 92 mm. It is handcrafted from steel and weighs approximately 800 grams. The surface is powder-coated and an anti-slip mat is attached to the bottom. There are two threaded holes, fitting the Quick Mount for Mini Paddle and Palm Single so they can be screwed on with the supplied screws. Mounting with the magnets of our Quick Mounts is also perfectly possible; the keys hold very well on the PaddleBase. 14 Mar 16: The LNR Mountain Topper Tri-Bander QRP CW transceiver, developed by by Steve Weber, KD1JV Designs, and manufactured by LNR Precision, Inc., is now available in kit form from Kanga Products (UK). It is a very small, very efficient three band QRP CW rig. This is a kit with a difference; the only part you have to do is put it into its case, fit the antenna socket and a couple of other sockets for key and headphones. The PCB is fully populated and has been tested by LNR in the USA before shipping. 14 Mar 16: QRPGuys is offering a range of CW-related kits at modest prices. These are: Mini Paddle (single lever), Mini Keyer/Paddle (single lever), Iambic Mini Paddle, Mini Keyer V1, Mini Keyer V2, and Code Practice Oscillator. Upcoming are versions of the single and dual paddle keys with bases included. QRPGuys also supplies kits for an EFHW (end fed half wave) Mini Tuner, Digital Dial / Frequency Counter, Digital RF Probe, and 12W, 50 ohm, Dummy Load/Power Meter. 14 Mar 16: If you took part in FISTS CW Club Europe's Exchange Your Age Week, please do send in a log. The closing date for logs is 31 March 2016. 11 Mar 16: Please join us in FISTS CW Club Europe Ladder sessions: Sunday 13 March 1400-1600 & 1800-2000 UTC. 06 Mar 16: The FISTS BrassPounder March 2016 newsletter has just been published. This edition includes details of the FISTS February 2016 Ladder. 04 Mar 16: This year marks the return of FISTS CW Club Europe's Exchange Your Age Week. It starts on Sunday 06 March 00:01 UTC and runs continuously until Saturday 12 March 23:59 UTC. Name, QTH, RST, member number (if applicable), & age in years (if available). 25 Feb 16: Please join us in FISTS CW Club Europe Ladder sessions: Sunday 28 February 1400-1600 & 1800-2000 UTC. 18 Feb 16: The latest version (3.2.5) of the free FISTS Log Converter program for Windows is now available. This version fixes an issue with EuCW Snakes & Ladders and includes some improvements. 15 Feb 16: The FISTS BrassPounder February 2016 newsletter has just been published. 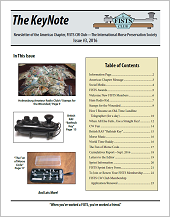 This edition includes details of the FISTS January 2016 Ladder and QRS Fifth Sunday. 12 Feb 16: Please join us in FISTS CW Club Europe Ladder sessions: Sunday 14 February 1400-1600 & 1800-2000 UTC. 12 Feb 16: The FISTS CW Club Americas Winter Unlimited Speed Sprint takes place on Saturday 13 February 1700-2100 UTC on 80m, 40m, 20m, 15m & 10m. 10 Feb 16: The latest version (3.2.5) of the free FISTS Log Converter program for Windows is now available. This version includes all FISTS Europe 2016 Activities. For anyone using the internal logbook feature, you can now enter FISTS Europe and EuCW activities directly from the logbook page using the new "Enter..." button at the bottom right. You can also use the new "Awards" button on the same page to assess your awards. The program is available from the download web page. Many thanks to the test team: Alex PA1FOX, Peter G4LHI, Robert DM4RW, and Richard G0ILN. 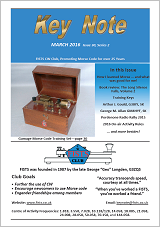 06 Feb 16: The February 2016 FISTS CW Club Down Under newsletter is available. 06 Feb 16: The FISTS CW Club Americas Winter Slow Speed Sprint (max. 13 wpm) takes place today on Saturday 06 February 1700-2100 UTC on 80m, 40m, 20m, 15m & 10m. The exchange includes: RST, U.S. state or Canadian province or DXCC country, first name, FISTS member number. Non-members send their power output in Watts instead of a member number. 29 Jan 16: The first ever FISTS Europe QRS Fifth Sunday (31 January, 0001-2359 UTC) is a whole day of QRS activity, maximum 14 wpm. 22 Jan 16: Please join us in FISTS CW Club Europe Ladder sessions: Sunday 24 January 1400-1600 & 1800-2000 UTC. 08 Jan 16: The FISTS Brasspounder January 2016 newsletter has just been published. This edition includes the final 2015 Ladder and Staight Key Week results.